The Melbourne Bus Link fleet of 84 vehicles now comprises 100 percent Scania product after the recent delivery of six new K 280 UB low floor Volgren-bodied buses. Scania Bus and Coach National Manager, Retail, Julian Gurney says he was delighted to see Melbourne Bus Link take delivery of the new vehicles. "Having a key private operator like Melbourne Bus Link 100 percent Scania-powered is excellent news for us and underlines the core Scania strengths of driver appeal, reliability, efficiency and after sales support we provide to all of our customers," he says. Melbourne Bus Link Managing Director since 1998, Russell Ward, says the company began buying Scania buses in 1999 and has been buying six vehicles a year since. "If the drivers, the passengers and the maintenance staff are happy with the product, then we’re happy," Ward says. "Now we have a full complement of Scania buses purchased since Melbourne Bus Link was formed in 1998." Melbourne Bus Link has depots in Footscray and Sandringham and runs routes in the western and southern suburbs. 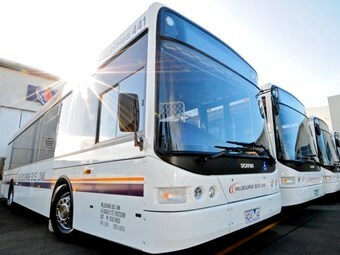 The fleet comprises 54 x L 94s, 24 x K 230s and the six new K 280 buses. "We are 100 percent Scania, 100 percent low floor and 100 percent air-conditioned," says Sam Distefano, Melbourne Bus Link Fleet and Infrastructure Manager. "We see benefits of being 100 percent Scania. We have vastly reduced parts inventory. We have worked with Scania to ensure we get the best possible price for parts. "Our technicians have been trained by Scania, they are familiar with the product and technology and this reduces the chances of errors creeping in during routine servicing, which makes for quicker turnarounds, as well. "Reliability has been exceptional," Distefano says. "If we do find an issue, we have a proactive approach of running preventative checks on other vehicles to reduce the potential for breakdowns. "We carry out a safety inspection every 5,000 km and service every 20,000 km. At 100,000 km we remove the radiator to clean it, and test thermostats. We replace the turbos at 300,000 km as well," he says. On average, a Melbourne Bus Link vehicle covers 70,000 km per year, working 20 hours per day from 5am. The company does not designate any bus to any route or any driver, and routine servicing is scheduled during quieter periods of the working day. "We have a very good working relationship with Scania," says Distefano. "We have found over the years the Scanias deliver better efficiency, better economy and the best cost per kilometre. We also like the EGR engines as we don’t need to handle AdBlue. "A standardised fleet means we need only carry one type of replacement parts, and added to the Scania modular engine concept, and all our bodies being supplied by Volgren, this reduces complexity and the chance for things to go wrong," he says.